The United Way of Northwest Illinois hosted an event on March 28, 2108, at the Mt. Carroll Township Public Library to launch the Imagination Library in Carroll County. Dolly Parton created the “Imagination Library” in 1996 for preschoolers in Sevier County, TN, to guarantee access to books and inspire parents to read to their children as much as possible. Since this time, Dolly’s concept has grown to over 1300 communities worldwide and provides books from birth to five years old. This is a critical time for learning as nearly 85 percent of brain development happens before a child turns three. 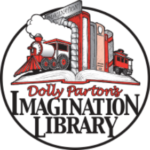 Dolly Parton’s Imagination Library is a 60 volume set of books beginning with the children’s classic The Little Engine That Could ™. Each month a new, carefully selected book will be mailed in your child’s name directly to your home. If you are interested in registering your child for the library, please contact the CCHA office for a registration form, or visit https://imaginationlibrary to register on-line. This entry was posted in News & Announcements on April 4, 2018 by pattyaccha@grics.net.